Three cheque types to simplify your life. See how much you can save on each below. Get 50% MORE cheques* when you order Manual Business Cheques. Offering a complete range of quality Manual Cheques. Available in 5 different background colors. Rush next day delivery to most of Canada available. 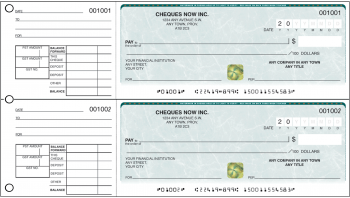 Get 25% MORE cheques* when you order Laser Cheques. Our Laser Cheques have the highest security features in Canada. Cheques are 100% compatible with any cheque software program that you use. Order online 24/7. Get 60% MORE cheques* when you order Personal Cheques. Pay less compared to what your bank charges. Plus receive AIR MILES reward miles on every order!